Happy 2011! And it is. My husband is recovering slowly but surely from major surgery. I’ve spent the past five days at the hospital/in a nearby hotel and have missed Romancelandia, but I’m sure Romancelandia’s gotten along just fine without me. 😉 If all goes well, he’ll be released later this week. Please keep your fingers and toes crossed. I’m still giving away books for the next THREE months–please see the News page for details. Tomorrow I’ll be at Romance Bandits, and Tuesday I’ll be at Seductive Musings. Thanks so much to SM’s Carrie Divine for designing this lovely Any Wicked Thing ad! Earlier this month Mistress by Mistake was #1 on Amazon’s Free Kindle list for several days. Free or not, it was a delightful surprise to be #1 at anything. 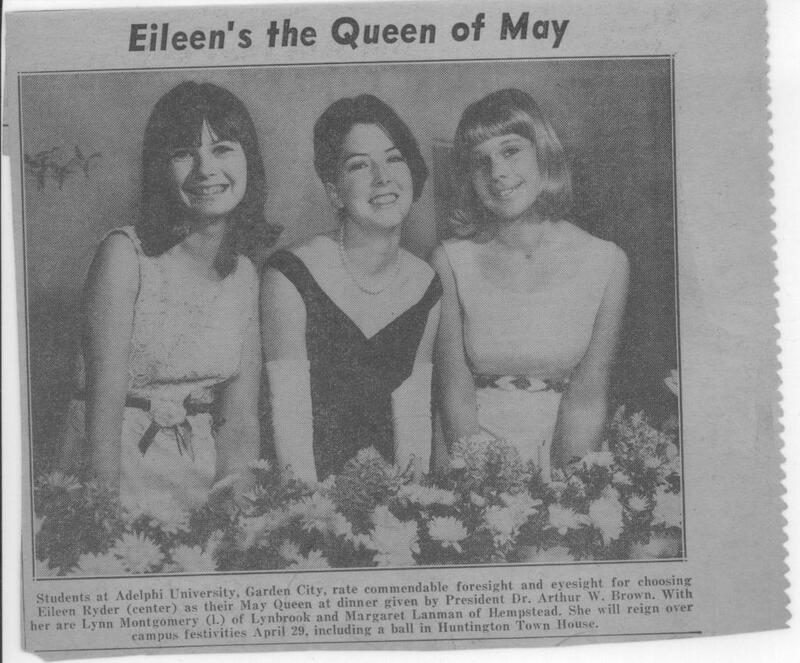 I’m still smarting from being second-runner-up for my college’s May Queen, LOL. Seriously, thanks to all of you who downloaded and hopefully enjoyed the book! And just for fun, me in my not-quite-May Queen days–a whole lot blonder and thinner! I picked up Mistress by Mistake for Kindle…my first Kindle book! LOVED IT. Really enjoyed the story. Cyndi, I’m so glad! I had a lot of fun writing it. What a lovely May Queen you would have been! There was a certain contest from my Mom’s high school days that she never got over losing–she would mention it from time to time throughout the years. Her school had a fund-raiser, which was really a popularity contest in disguise. Whoever raised the most money would be crowned the Queen and King at the dinner-dance. The event was open to the community in hopes of raising more money. Mom had worked hard, and was ahead of everyone with her collections. At the last minute, the uncle of one of her classmates, feeling no pain and having a great time, was moved by the “spirit” of generosity into making a large donation to his niece. He dropped a fifty dollar bill into her collection bucket and that was the end of Mom’s chance for a moment in the spotlight. This was the early fifties, and $50 was a big contribution! Loved your story, Virginia. 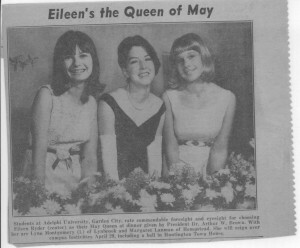 I joke about my May Queen thing–the girl who won was adorable, the most popular girl at school and the 1st runner-up was a professional model, so I guess I was pretty lucky to be included at all, LOL. My husband had a severe health issue last spring. With this surgery everything should get back to normal, with everybody’s everything crossed! Thank you, Patricia! We came home from the hospital today…thru a blizzard. I kept thinking he’d gone thru so much it just wouldn’t do to go off the road, so I drove so slowly I’m sure I made the people behind me crazy. Maggie, sorry I have been AWOL myself but glad your hubby is doing a lot better! Love your Queen of May photo!!! Thanks for stopping by, mrs s! I can’t believe I’ve still got the newspaper clipping, altho my dad went and bought 20 papers or something like that, LOL. The dress was yellow & I’d worn it as a bridesmaid. My mom took the sleeves off for the banquet. Nowadays, I do not wear sleeveless dresses. Arm flab!